Have you ever attended a local party meeting? People get off-topic a lot. People argue louder and louder while one person repeats their point for a third time. You have a correction to some recently shared information, but there are 5 people ahead of you on the speaking list… You name it. In these never ending meetings, I always wished to cut all these situations short. Here comes the answer: Our partner Lara has a method she calls „Use your hands“. 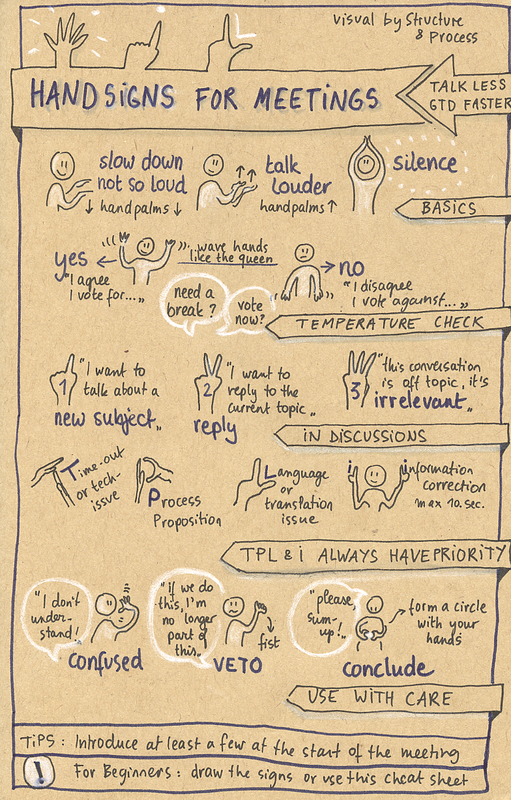 She has compiled and illustrated the handy list of signs you can use during meetings. These signs have their roots in sign language and in different activist movements. For example the Occupy movement uses them, too. „But you don’t need to be an activist to use them, right?“, points out Lara. She advises to introduce the signs before using them, and to explain how they make things easier. „I always draw them somewhere visible for the whole group, too“, Lara tells. In her meetings and facilitation situations, she usually introduces only a few of the signs to find out whether people are curious and enthusiastic about the idea. Maybe I will take the list to my next party meeting and see how curious my fellow party members get. What are your experiences in meetings? Do you find the signs helpful? Would you try these signs in actual meetings?